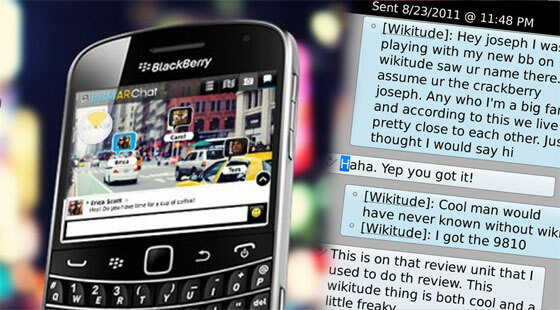 Wikitude Augmented Reality browser and BlackBerry Messenger - cool or creepy? The other night, a curious thing happened: I got a BlackBerry Messenger contact request. That in itself is nothing really out of the ordinary; my BlackBerry Messenger bar code is floating out there on the internets. I almost alwasys ignore the contacts I don't recognize. No, this request came via the Wikitude Augmented Reality browser on this BlackBerry Torch 9850 that I just reviewed. A gentleman named Dustin saw my BBM name in his Wikitude browser and used the application to make the BBM contact request. Figuring that there are very few Joseph Holder's out there with BlackBerry OS7 devices, Justin correctly guessed that I write for CrackBerry.com. We had a brief conversation, and I got to feel like a (rather) minor celebrity for a bit. The whole exchange got me to thinking. Is finding new BBM contacts using the Wikitude browser cool or a little creepy? When we discussed the feature on one of our podcasts, I remember thinking that I was leaning toward the creepy side. After this one encounter with the service, my mind is made up. Finding new people through the Wikitude Augmented Reality Browser is not cool; it is very cool. We've already seen a couple of videos demonstrating how to find a person's BBM contact using the Wikitude AR browser - and indeed find a person. After starting the AR browser, selecting the BlackBerry Messenger world view will show you visible BBM contacts within a certain distance. Turning around in a circle, you can actually see where those BBM users are in relation to you. Tapping one of the tags starts the standard BBM invite request. In many ways, adding contacts through the Wikitude browser is just one of the many, many ways to add a BBM contact. How people will actually use this feature remains to be seen. Research In Motion has focused its demonstrations in the business setting. Think of a business meeting on the golf course. I know it's cliché, but a lot of business still gets done on the back nine. Let's say you want to add your new client, Bill, to your BBM contacts. Just find him in the Wikitude browser and add as a contact. No fumbling around with cameras and barcodes needed. Sure there are many ways to add a BBM contact; using the Wikitude browser is just cooler. Now imagine that you've lost track of Bill. After finishing the 18th green with a 3-putt bogie, Bill just ...disappeared. Remembering that you just found him in the AR browser, you start Wikitude and soon meet up with your client in the clubhouse. After that round, Bill needed a bit more than a soda to quench his thirst. Me, I think the Wikitude Augmented Reality browser will be used for flirting. Think about it. Gazing through the Wikitude browser, you spot an attractive person sitting across the bar/club/pot luck dinner. Even better, there's a BBM contact tag right next to them on the screen. You tentatively send out a BBM contact request and start up a conversation. This isn't out of what is already ordinary for BlackBerry Messenger. In Saudi Arabia, it's not uncommon for single men to stencil their BlackBerry Messenger bar code to the back of their vehicle. Why? To meet girls, of course. Interested parties can scan the code and start a conversation. 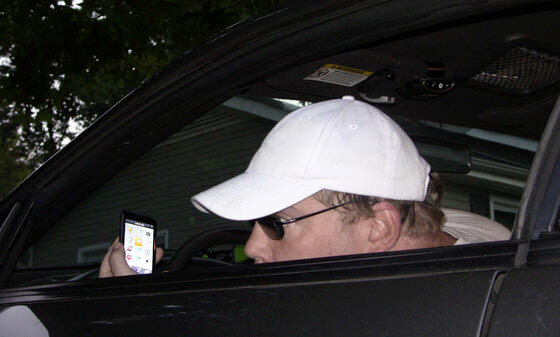 First and foremost, you are in complete control over who sees you in the Wikitude browser. When it comes to being found in the AR browser, you can choose to be invisible; visible only to your existing contacts; or visible to the world. At any time, I can change how others' Wikitude browsers see my BBM contact information. By default, the Wikitude browser is disconnected from BlackBerry messenger. To make yourself visible to the Public (BBM name, avatar, and status message), you'll have to connect Wikitude to BBM and set your status to Public. Both options are found at the top of the Wikitude app's settings (inside the Wikitude app, press the menu key and select Settings). 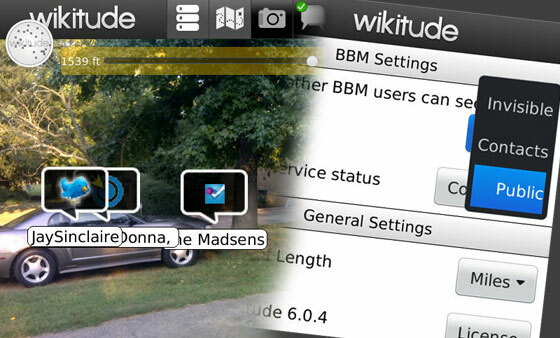 Okay, you say to yourself, I can use the Wikitude Augmented Reality browser to find and be found by other BBM users. I even have control over who can see me. But what if one of my new contacts is a jerk, contacting me at all hours of the night? BlackBerry Messenger has had that one covered for a while. It's very simple to delete a BBM contact (highlight the contact, press the menu key, and select "Delete Contact"), and if the person tried to add you as a contact again, it's a simple matter to block all future requests as well. In this way, BBM is superior to text messaging. Giving out a number so a person can SMS message you means they can always contact you for as long as you have that phone number. In my experience, it is a huge headache trying to get the phone company to block specific numbers. With BBM, you're just a few simple clicks away from blocking someone from messaging you forever. Perhaps the reason we are wary of finding new BBM contacts using the Wikitude Augmented Reality Browser is because it is a brand new thing. There are no rules for its use, no guidelines to follow. Manners and politeness are extremely important in both the business and social worlds. But even the great Amy Dickinson might pause for more than a moment when asked for advice on this subject. Therefore, it is up to us to define what is appropriate and what is not. For example, if you change your Wikitude settings to allow your BBM location data to be Public, I feel that means that you are willing to get - actually expecting to get - BBM contact requests from strangers. I've met some interesting - albeit random - people in forums and chats around the internets. Is this all that different? At the very least, you'll always have a conversation starter: how much you love your new OS7 BlackBerry Smartphone. On the other hand, I feel the generic "[BBM Name] would like to add you as a contact" message sent when adding a new contact is woefully insufficient for this purpose. Unless you're sitting face-to-face with your potential contact, you should introduce yourself in the contact request message. How that introduction is made is up to you, but ones that begin, "I've been watching you for the last two hours..." will most certainly find their contact request Declined and Blocked. So where does that leave us? The Wikitude AR browser gives us the chance to add and be added by contacts that we might not never encounter without the service. It gives us yet another BlackBerry Choice for adding new BBM contacts. It lets us find Bill - our golfing client - at the 19th hole. Is making your BBM self available to be found by others really all that scary? You always have the option to make yourself invisible. You always have the option to decline or ignore a contact. You always have the option to delete and possibly block a contact. Ultimately, the decision to use the BBM features of the Wikitude Augmented Reality Browser is up to you. Certainly, there are bound to be some awkward moments as we as a BlackBerry community begin to decide just what is impolite, rude, or irritating. On the flipside, those who choose to use the BBM features will be the ones who will define its etiquette. Quite literally, finding contacts using the Wikitude AR browser will be what we make of it.